Today was an interesting day because I finally made it to VegFest, a local vegan and vegetarian festival in Sacramento. 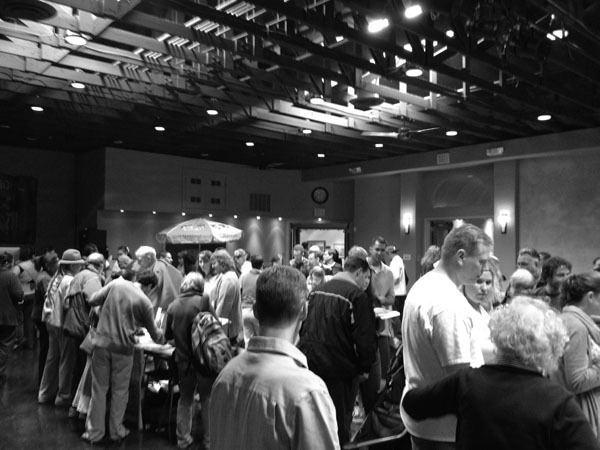 And it was very popular and crowded! 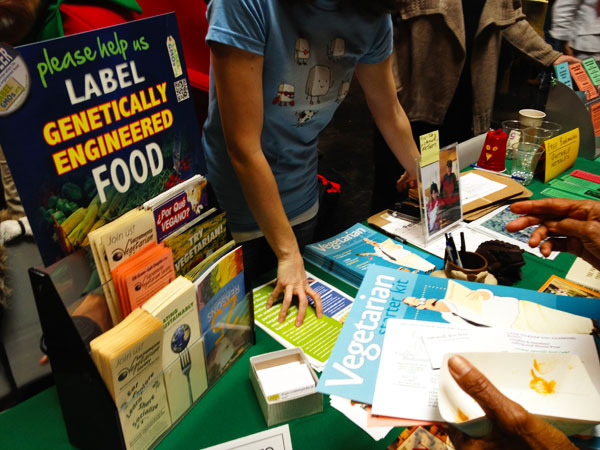 Seeing so many people interested vegan and vegetarian food, demonstrations, and products was very inspiring even if a little hard to navigate my way through the crowd. 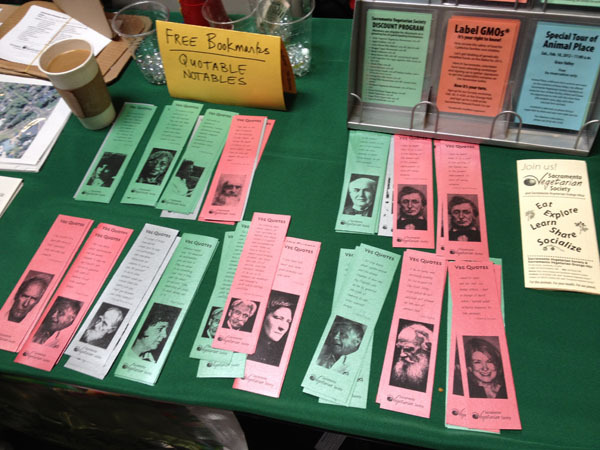 There were informative displays from local groups, like the Sacramento Vegan Society, including free bookmarks with vegan-related quotes on them from Martha Stewart, Cesar Chavez, and Abraham Lincoln. I grabbed one of each, no more TP squares and Cosmo subscription cards as bookmarks. 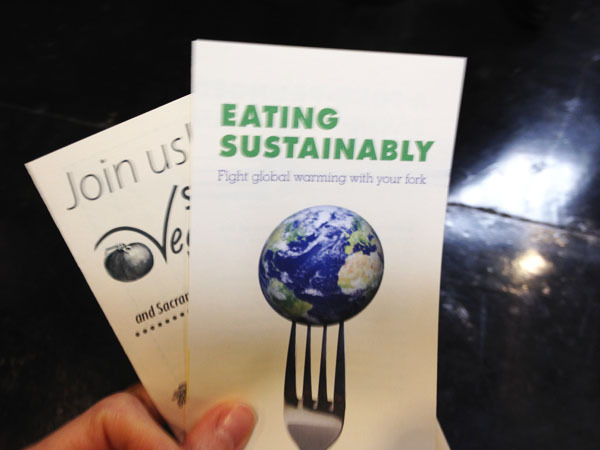 And I collected plenty of literature about the cruelty, environmental and health impact of factory farming to rejuvenate my passion for veganism. I also stuffed on plenty of free samples, my favorite kind. 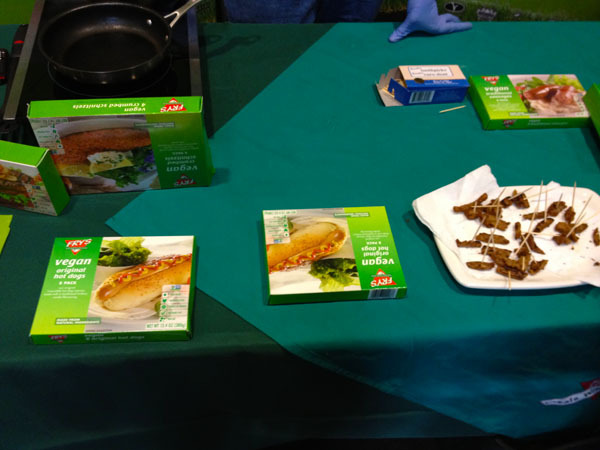 :-) Like Fry’s Vegetarian vegan beef and chicken nuggets which weren’t bad and very popular samples. I’m not a huge fake vegan meat person anymore, but products like this are nice to keep in the freezer to share with non-vegan friends and family occasionally. There was also a local Sacramento caterer, Mama Kim Cooks, serving impressive samples of butternut squash soup and super crispy, greasy, and decadent sweet potato chips. 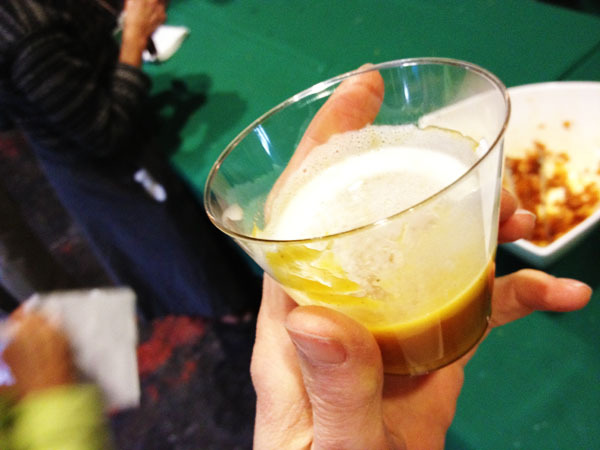 I mentally cleansed after that with a raw food demonstration, Brooke from The Green Boheme demonstrated making a fabulous pecan, date, and blueberry cobbler that was served with a sweet vanilla almond milk ice cream and out of this world. 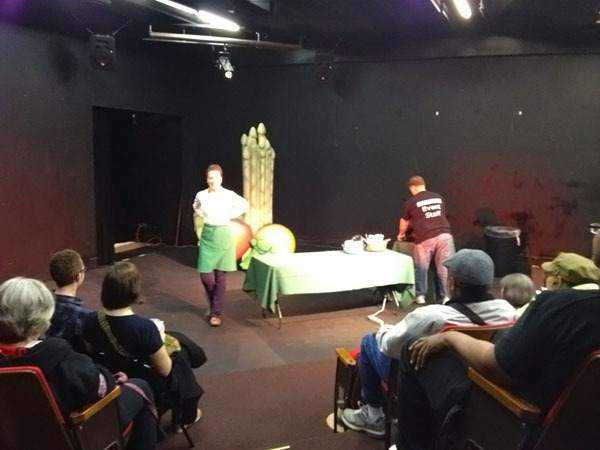 The demonstration was packed with many people taking notes on the recipe. 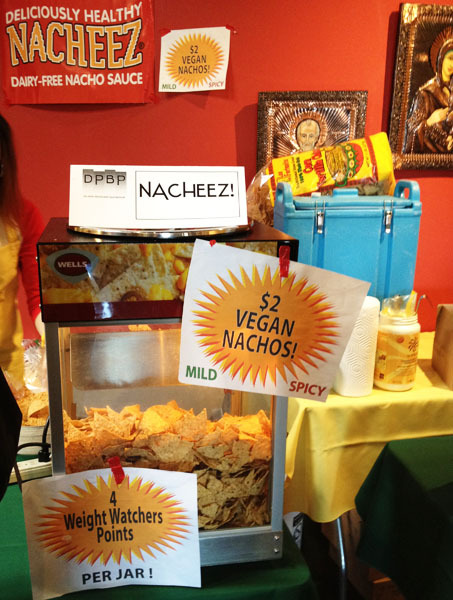 But after I had a set back with more vegan comfort food, could you really resist $2 spicy vegan nachos? 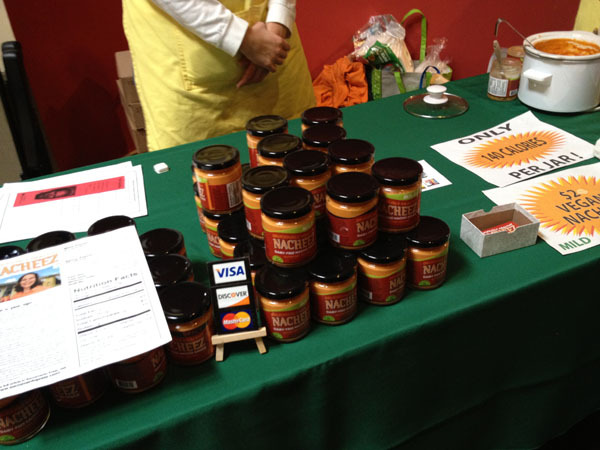 Especially when the cashew-based nacho sauce is made by local company Nacheez? 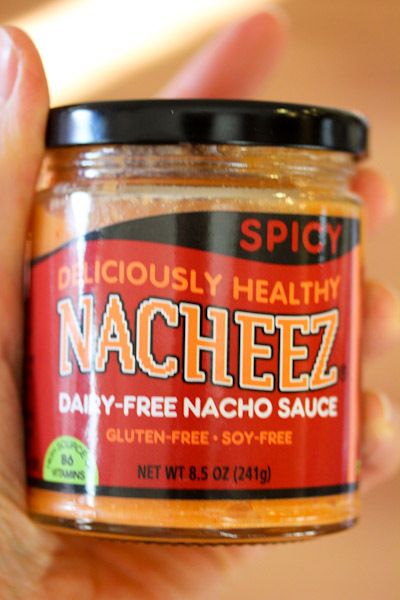 I ended up buying a jar of the spicy vegan nacho sauce for a Superbowl party tomorrow, we’ll see how it stacks up for a group of non-vegan, wing loving guys. We managed to save room for lunch between all the sampling and for $6, I got an impressive vegan plate served by a local vegan bread shop/restaurant I never knew existed – Azna Gluten Free. 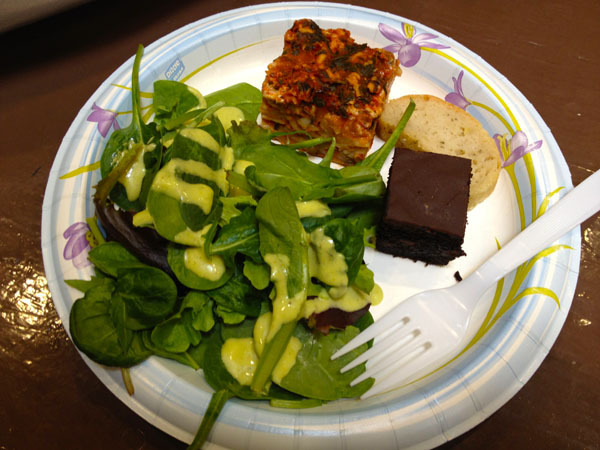 The lasagna, tangy salad dressing, and mini brownie were outrageously good, I cleaned the plate pretty promptly. 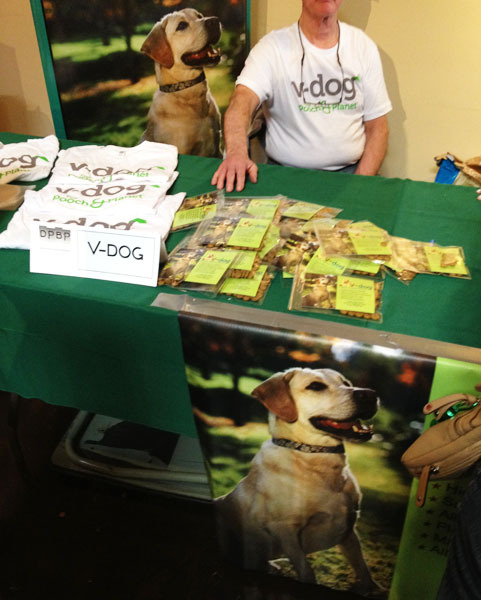 V-Dog vegan dog food also had a display handing out samples of their dry dog food and information where I was thrilled to learn they’re a local company in Sacramento. And they offer free shipping if you can’t find their dog food locally. 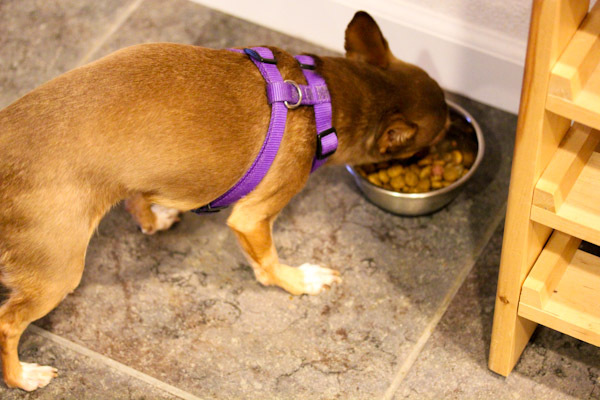 Both of our chihuahuas were happy to chow down on the samples in their dinner tonight, Leela is actually warming up to dry dog food more. The event only set me back $17 which included admission, lunch, vegan nacho sauce, and vegan nachos – not bad at all. I purposely only took $20 in cash to limit my spending and had change to spare. It was totally worth it and something I’ll try to get to again next year. I’m still aggressively working on saving money this year, partly for experimentation and partly for a new car. 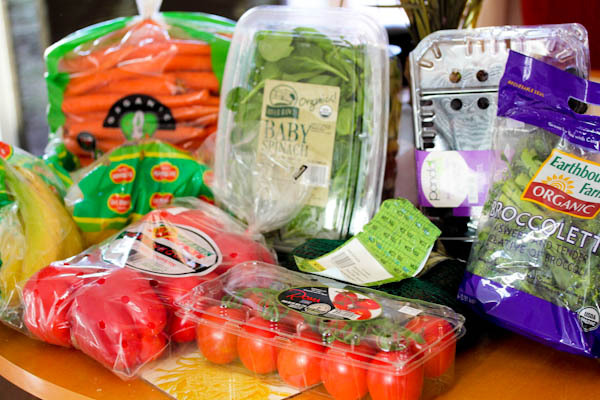 So I’ve been working on sticking to a slim grocery budget by buying just what we need and planning to shop at stores where I know I can get items cheapest instead of lazily buying everything on my list at one, like Whole Foods. For serious produce restocking, Costco usually has the cheapest prices on organic produce in our area and I braved a trip there on the way home to load up. It was a patience tester since our local Costco is ruthlessly crowded on weekends, just getting into the parking lot is a trying test. But for about $42, I scored pretty good with a big box of organic spinach, bag of organic broccoli, 10 lb. bag or organic carrots. two huge packs of bananas, 6 red bell peppers, huge box of grapes to freeze for desserts, 5 avocados, and a big box of roma tomatoes. 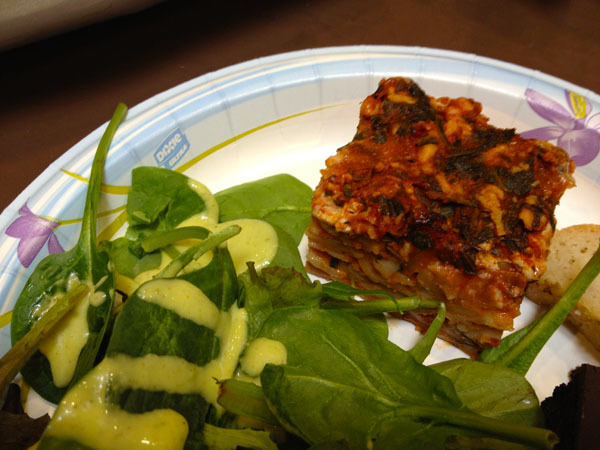 The lasagna and mini brownie look great but the spicy vegan nacho sauce…now THAT is a great little find. And I can’t believe it’s already VegFest time of year again….it seems like I remember reading about this on blogs about 3 mos ago…and it’s been a year already. Glad you were able to partake. Looks so fun! Looks like a great event!! I’ll be interested to see how you like that nacho sauce! The spicy sauce is really good, but I adore lots of kick. Hopefully the guys will like it. Sounds like a fun event. Glad you got to go. I like your website redesign overall, but find the text harder to read than previously. Could the font be made darker? Sure, I am still tweaking the new look and have that on my list as well as making the links bold. Thanks for the feedback. I missed it last year and almost missed it this year, it needs more advertising! I found out about it from a Green Boheme email about a week before.